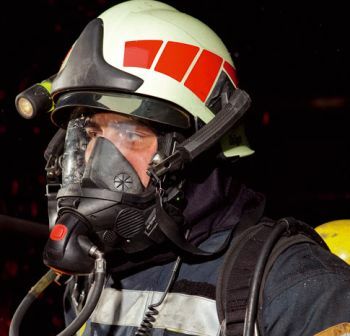 The Drager HPS 6200 - a firefighter's helmet in a class of its own. Optimum protection even at extreme temperatures. High wearing comfort and a good climate inside the helmet. A wide range of accessories is available to complete the head-protection system. In close cooperation with our customers worldwide, we have developed the Drager HPS 6200 firefighter's helmet. The full shell helmet Drager HPS 6200 has been specially designed to meet the requirements of the new standard EN 443:2008 - Type B and is at the moment the lightest helmet of its kind presently on the market that is approved to this standard. The helmet shell of high-temperatureresistant duroplastic - additionally reinforced by state-of-the-art aramid fabric - withstands even the most intense heat from open flames or radiant sources. Thus, the helmet offers maximum protection against penetration as well impact even under the influence of extreme heat. The helmet shell is pressed using the SMC process, then provided with an optimized, particularly durable paint coating - a process that also assures inherent fire protection. As a result, the Drager HPS 6200 is virtually unbeatable in terms of robustness and paint-bonding. The visor of the Drager HPS 6200 - made of highly thermally stable polysulfone material - has been extended down to the chin area and thus offers protection for the entire face (approved according to EN 14458 and classified as 'face protection'). The amber-tinted visor is equipped with an anti-scratch coating on both sides and is available with or without gold coating for applications with high infrared (IR) radiation. The supreme, unsurpassed wearing comfort of the Drager HPS 6200 is achieved by an advanced 3-point harness together with an ergonomic and skinfriendly padding. The harness can be adjusted individually by means of straps (in the neck area) and easy-to-adjust Velcro fastening (in the chin area). The protective padding (made of Nomex material) in the cheek and ear area guarantees great acoustic sensitivity and optimum wearing comfort at the same time. The harness is made of fireproof and washable Nomex/Aramide fabric, the headband of washable eco-leather. To make the helmet suitable for smaller head sizes (50 and 51) too, an additional padding element can easily be integrated into the helmet shell. The integrated flameand heat-barrier guarantees a steady pleasant climate inside the helmet - even when temperatures are rising. The Drager firefighter's helmet Drager HPS 6200 and the full-face mask Drager FPS® 7000 have been designed to perfectly fit together. By combining the two system components, maximum protection and ergonomics in terms of head and breathing protection are guaranteed. The Q-Fix version allows you to quickly and easily attach and use the Drager FPS® 7000 full-face mask, while ensuring optimum safety. The unique, patented and selfsecuring mask-helmet combination offers the maximum protection and wearing comfort. The wide range of accessories available allows you to optimally adjust the helmet to the different applications of fire brigades and departments. Beside the wellknown trapezoid-shaped front plate, an optimized designed 'Romanic' version is available, too. The frontplate is particularly suited to attach customer-specific identification features and symbols. For more safety and to facilitate the localization of wearers in poor visibility conditions, reflective strips are available in different design styles made of flame-retardant material. Neck curtains are also available in different versions in terms of design and materials, ensuring optimum protection in the neck/throat area against thermal and mechanical stress. Furthermore, a wide range of accessories is available, like e.g. communication systems and helmet lamps. They are easy in assembling in case of special adapters.